Oregon AFL-CIO Weekly Update: Val Hoyle Wins! Val Hoyle Wins Labor Commissioner Race! “Union members across our state have been knocking on doors, making phone calls and getting out the vote for the candidates and issues that will have a positive impact on the lives of working people. 2018 is an important year for working people. We are seeing workers stand up, fight back and win: from teachers striking and walking out across the country to our victory defending healthcare for hundreds of thousands of vulnerable Oregonians in January on Ballot Measure 101; these wins are an inspiration to workers nationwide. With anti-union and anti-worker policies on the rise in Congress, the Supreme Court, and beyond it is more important than ever that we stand together to create positive changes for working people. In Oregon, we are doing exactly that. We are proud to see Val Hoyle - a lifelong advocate for working people who comes from a union family and shares our values -win the race for Oregon’s Labor Commissioner. She is the leader we need at the Bureau of Labor and Industries to protect workers’ rights, expand registered apprenticeships, and fight harassment and discrimination in the workplace. The Oregon AFL-CIO will vote on endorsements for the 2018 General Election in the coming weeks and look forward to standing together with our allies across the state to support candidates who support working people and our unions." 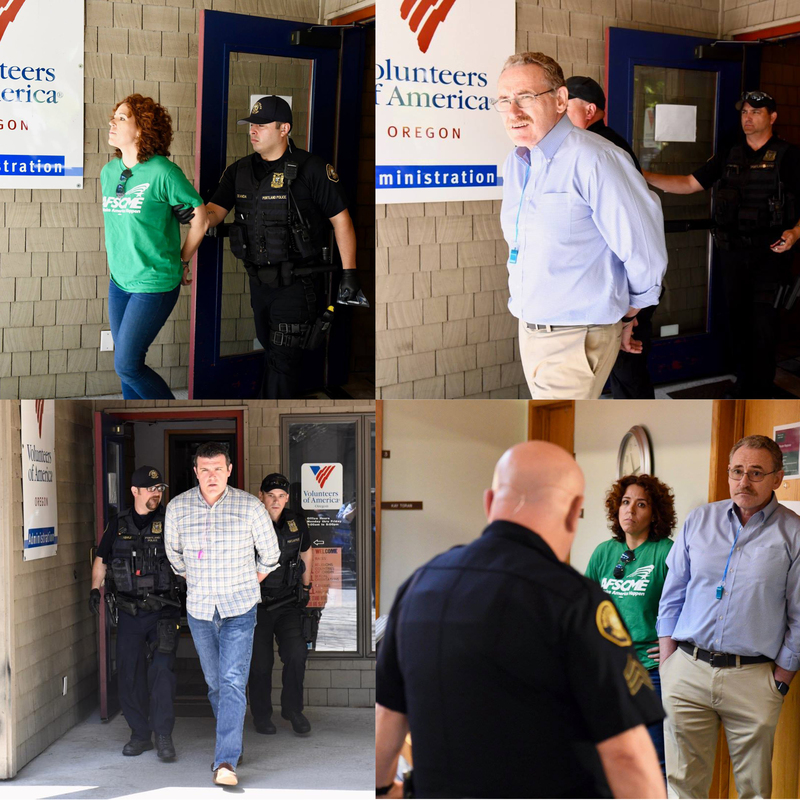 Nine labor activists, including Oregon AFSCME Executive Director Stacy Chamberlain, Oregon AFL-CIO President Tom Chamberlain and Chief of Staff Graham Trainor, were arrested on May 14th while participating in a peaceful sit-in in support of VOA Workers, who are bargaining a first contract. "These workers come out everyday and help the most vulnerable in our community. We are proud to stand with them and will do whatever it takes, including civil disobedience, in order to secure a contract that protects their rights." said Stacy Chamberlain as she headed into the sit-in." The sit-in was an act of civil disobedience in support of workers at VOA, who have been bargaining for a first contract for over a year following an organizing drive with Oregon AFSCME. The arrested activists , were cheered on by a crowd of fifty supporters outside who were chanting in defiance to the arrest. Do your part to help VOA workers get a fair contract and sign the petition today. The sit-in comes over a year after VOA workers sat down to bargain a contract. Despite workers coming to the table and meeting the management team on many issues, VOA management has refused to sign off on a contract protecting union rights. VOA is demanding an open shop, essentially contractual right-to-work clause, meaning workers would not be required to pay dues to support representational and contractual activities. Over 85% of the workforce elected AFSCME as their representative and have made it a priority to not sign a contract that would weaken their union from the outset. The Oregon AFL-CIO is committed to standing up and speaking out when workers aren’t being treated fairly. Monday's civil disobedience at the VOA office in Portland is another example of our commitment to our affiliates, and our commitment to working people. VOA, who has spent money meant for client-care on a union-busting consultant, has fought the workers' efforts at every turn. Workers at the non-profit live at or near the poverty line while the CEO Kay T. Doran receives a total compensation of over two-hundred thousand dollars. Workers are demanding a fair contract that lifts people out of poverty and gives them a voice in client care. 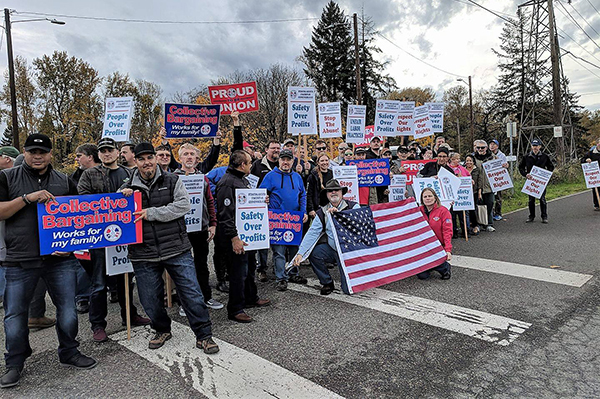 After an eight-month legal battle, 100 welders at Precision Castparts in Portland, OR got one step closer to having union representation when they were on the winning end of a recent decision under the NLRA. In September 2017, the group voted to join the IAM, but the company disputed their ability to do so. Workers at the plant make heavy-duty metal components for airplanes, generators and other industrial products. Precision has until May 18 to request a review of the decision. The U.S. Supreme Court will make a decision in the coming weeks whether or not to undermine the freedom of millions of teachers, nurses and other public workers to have strong unions. This week, the National AFL-CIO has launched a new website, FreedomToJoin.org, that provides critical information about the Janus v. AFSCME case, counters misinformation, explains the value of union membership and draws attention to the wave of collective action in America. Big-moneyed corporate interests have brought Janus v. AFSCME forward because they understand how working people in unions can negotiate a fair return on our work. While its focused on public employees, Janus is part of a multipronged attack on our institutions and values we hold dear. Right-wing corporations have tried to crush public unions for decades, and they’ve poured tens of millions of dollars into this case alone in an effort to slash pay and cut benefits for nurses, EMS workers, 911 dispatchers, security personnel and others who keep our communities clean and safe and provide other essential public services. Yet even in the face of these attacks, all over the country workers are organizing and striking as we haven’t seen in years. America is waking up to the benefits of unionism, and we’ll continue to organize and mobilize, no matter what the Supreme Court decides. Newer PostCEOs Pay Themselves What? Older PostIt's Time to Vote!